This Picture of Sgt. Marshal H. Shannon was taken while the regiment was encamped at Fairfax Court House Virginia, soon after reaching the front around October 12, 1862. The date and location was determined because First Lieut. John C. Groswold of Company F also had his picture taken with the same back drop. 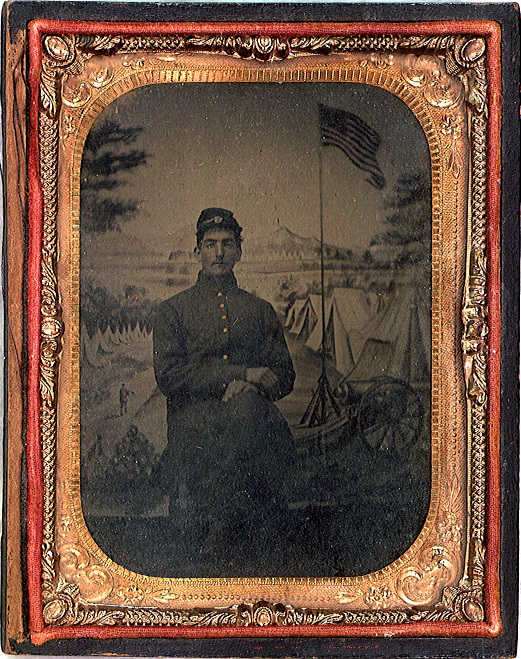 He sent his picture home with a letter dated October 12, 1862. So Marshall's picture had to have been taken around the same time and at the same location. During the Civil War people carried pictures of their loved ones in a small, decrative case called a Union Case. The case was made through the "union" of shellac and sawdust to create a form of thermoplastic. This mixture was heated and pressed into intricately designed molds to create both halves of the Union Case. Brown or black dyes were added into mixture to color the case. The picture you see here is actually one half of a Union Case. I have no idea what happened to the other half, but you can see the marks where the hinges once were on the side that survived. If you look carefully, you can see that the buttons on his coat are yellow, the stripes in the flag are a little red and the field of blue in the flag is an extremely dark blue.